Democratic state lawmaker Laura Kelly was elected to be the governor of Kansas on Tuesday, defeating Secretary of State Kris Kobach, a close ally of President Donald Trump’s known for his activism on immigration and voter fraud. Kelly, who has represented Topeka in the state Senate since 2005, had tallied 49 percent of the vote when The Associated Press called the race in her favor. Kobach and Greg Orman, an Independent candidate, received 42 percent and 6 percent of the vote, respectively, when the race was called. Tuesday’s result will assuredly generate debate, not just in Kansas, but across the U.S.
Kobach’s coziness with Trump was seen as a potential liability in Kansas, which chose Texas Republican Sen. Ted Cruz over Trump by a 48-23 margin in the March 2016 GOP presidential caucuses. Former GOP Gov. Sam Brownback has also posed a problem for Republicans. Brownback, who left office Jan. 31 to serve as ambassador-at-large for International Religious Freedom, was criticized by Democrats and Republicans alike after income tax cuts he pushed through created a hefty budget deficit. Brownback had a 25-percent approval rating as of July 2017, making him the second least popular governor in the U.S. at the time. 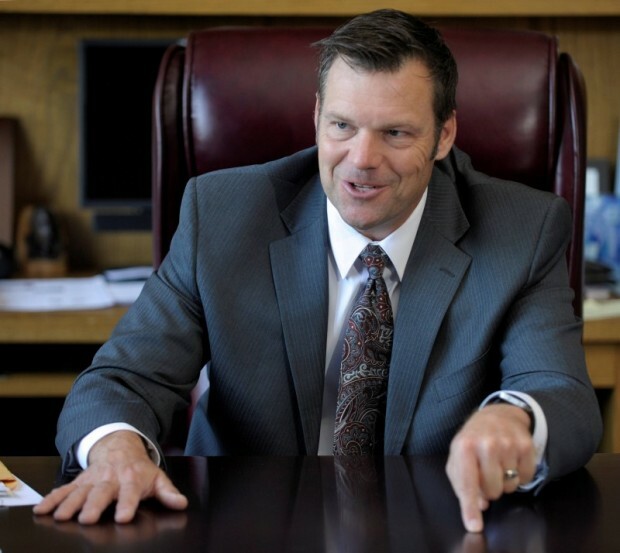 Kobach has proved a polarizing figure in his own right. Former Kansas Gov. Bill Graves, a moderate Republican who left office in 2003, endorsed Kelly over Kobach. Kobach, who won his primary against current Gov. Jeff Colyer by 343 votes, also served as vice chairman of the Presidential Advisory Commission on Election Integrity, which was formed to review cases of voter fraud and voter suppression. Brown’s victory comes despite Orman’s candidacy. A moderate, Orman was widely seen in Kansas as a closer alternative to Kelly than to Kobach. Orman’s campaign treasurer, Tim Owens, resigned his position on Oct. 30 and endorsed Kelly. Kelly is considered a moderate. She campaigned on improving the state’s Medicaid system and addressing budget issues that Brownback left behind. Kelly’s victory snaps a Republican winning streak for national and statewide office that began in 2010. Republicans were 32-0 in those races until Tuesday, according to the Kansas City Star.